The Mercedes-Benz models A 180 d (with dual-clutch transmission; combined fuel consumption: 4.5-4.1 l/100 km; combined CO2 emissions: 118-108 g/km)[i] and A 200 (with dual-clutch transmission; combined fuel consumption: 5.6-5.2 l/100 km; combined CO2 emissions: 128-120 g/km)1have successfully completed the TÜV validation audit for the Environmental Certificate. This certificate is based on a life-cycle assessment in which the independent experts at TÜV Süd (German Technical Inspection Authority) comprehensively examine the environmental impact of the passenger car over its entire life cycle. More details about the Environmental Certificate can be found in the documentation series “Life Cycle”. The new A-Class came to the starting line with new efficient diesel and petrol engines throughout. 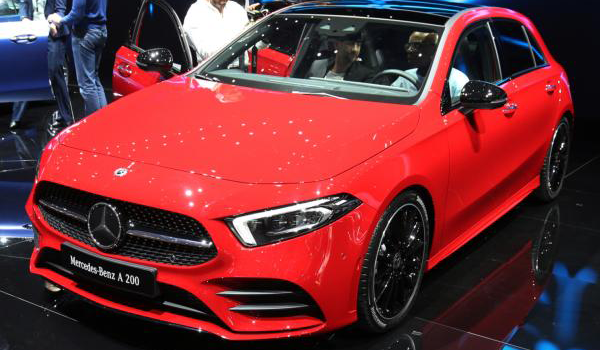 And with a Cdvalue from 0.25 and a frontal area (A) of 2.19 m2, it is the aerodynamic leader in its segment and at the same time better than the predecessor (Cd value: from 0.26/frontal area: 2.20 m2). As many other cars from Mercedes-Benz, the new A-Class is certified according to Euro 6d-TEMP and for this purpose also has completed the so-called RDE road test (Real Driving Emissions). This has effects on the life-cycle assessment: the exhaust emissions during the phase of its use were calculated based on the applicable RDE limits. Compared to earlier life-cycle assessments, driving operations therefore have a greater share of the entire life cycle. The comprehensive life-cycle assessment also comprises the emissions from the production and recycling phase in addition. Manufacturing vehicles requires a high degree of material usage. For this reason, one developmental focus is on further reducing the use of resources and the environmental impacts of the materials used. To this end, renewable raw materials and recycled plastic materials (recovered plastics) are also used. Some examples from the new A-Class: The reinforcing frame of the sliding sunroof is completely new. In combination with a thermosetting bonding agent, a natural fibre mat replaces the conventional sheet steel frame. In addition to saving resources, this also cuts the weight nearly by half. With the Dinamica® material, a high-quality secondary raw material is used in the interior of this model series. The completely redeveloped structure of the instrument panel also contributes to conserving resources: Because this allowed optimising the production process, there is a lot less stamping waste. A recycled material composed of reprocessed starter batteries and bumper panelling is used for the wheel arch linings. [i] All stated figures were determined in accordance with the prescribed measuring method. These are the “NEDC CO2 figures” according to Art. 2 No. 1 Implementing Regulation (EU) 2017/1153. The fuel consumption figures were calculated based on these figures.